Simplify Your Riding, Wendy Murdoch, Carriage House Publishing, 2004. Centered Riding, Sally Swift. Trafalgar Square, 1985. 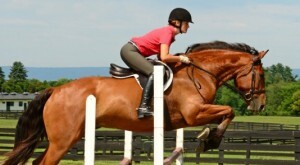 The original work on rider position as it relates to the horse. Reflections on Equestrian Art, Nuno Oliveira, J.A. Allen, 1988. Wonderful inspiration. Reflections on Riding and Jumping, Winning Techniques for Serious Riders, William Steinkraus, Trafalgar Square Publishing, 1997. A must read for everyone who jumps. Classic Show Jumping: The de Nemethy Method, A complete System for Training Today’s Horses and Riders, Bertalan de Nemethy, 1988, Steinkraus’ coach. Excellent photos. Athletic Development of the Dressage Horse, Charles de Kunffy, Howell Book House, 1992. 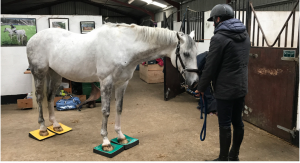 Good description of working in an arena using lateral positions to gymnastically improve your horse’s flexibility and strength. Simplify Your Riding – Ride like a Natural! Part 1-3, Wendy Murdoch. Wendy has taken her book and created Part 1 and 2 of this three part series. The final DVD is exercises on the Equiball to improve your riding. Western Saddles – How to Fit: Pain Free, Joyce Harman. This is an excellent DVD for helping you fit your Western Saddle. Dr. Harman is currently working on a book to go with it. English Saddles – How to Fit: Pain Free, Joyce Harman. This DVD supplements Dr. Harman’s book, The Pain Free Back and Saddle Fit Book. For those of you who do better watching than reading this is for you! Centered Riding 1 & 2, Sally Swift, Trafalgar Square Publishing. Basic Techniques of Riding and Jumping, William Steinkraus, Dark Horse Productions. 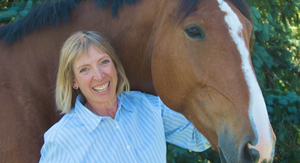 The Visible Horse and The Visible Rider, Susan Harris, Trafalgar Square Publishing. 2000. Work in Hand I & II, Bettina Drummond, Pryn Stud. 2001. The Art of Classical Dressage with Arthur Kottas Part 4: From Prix St. Georges to Grand Prix, Arthur Kottas. The Dynamic Horse by Hilary Clayton, BVMS, PhD, MRCVS, 2004. The Dynamic Horse Seminar in book form. Dr. Clayton has made the biomechanics of the horse easy to understand. Just read the words and look at the pictures, ignore the math and you will learn a tremendous amount from this book. ABC of the Horse Atlas, Pauli Gronberg, 2011. ABC of the Horse Atlas is a handbook of equine anatomy.. The extensive anatomical section contains a wealth of information on the skeleton, ligaments, and muscles. The latin and English nomenclature is complemented by unique full colour illustrations which clarify the position and relationships of anatomical structures. Horse Gaits, Balance and Movement, Susan E. Harris, Howell Book House, New York, 2005. How horses move as well as how riding, conformation and other factors affect movement. Profusely illustrated. Now available in paperback. Anatomy of the Horse, Peter Goody, J.A. Allen, London, England. Detailed line drawings and diagrams of skeleton, muscles, systems and structures of the horse. The Coloring Atlas of Horse Anatomy, Robert A. Kainer and Thomas O. McCraken, Alpine Blue Ribbon Books, 1994. Good for people who needs hands on approach. That Winning Feeling! A New Approach to Riding Using Psychocybernetics, Jane Savoie, Trafalgar Square Publishing, 1992. Extremely positive and popular showing the power of the mind applied to all kinds of riding. Heads UP!, Practical Sports Psychology for Riders, Their Families and Their Trainers, Janet Sasson Edgette, PsyD, Doubleday, 1996. Janet is an excellent speaker as well. Inner Tennis by Timothy Galway and/or Inner Skiing by Timothy Galway and Bob Kriegel. Random House. Explanation of the “inner game” and its application to learning, “personal best” and competition. Zen in the Art of Archery, Eugen Herrigel, Vintage Books, 1971. Excellent on awareness, centering and learning to allow. Anatomy of Movement, Blandine Calais-Germain, Eastland Press, Inc. 1993. Excellent, simple and well-drawn book on human anatomy. The Anatomy Coloring Book, Wyn Kapit & Lawrence Elson. Harper & Row, NY, 2013. Clear and inexpensive guide to human anatomy that is used in medical schools. Relaxercise by David and Kaethe Zemach-Bersin & Mark Reese This book offers ten easy-to-do Awareness Through Movement® exercises which can be done either sitting in a chair or lying on the floor. The book includes special chapters on back pain, posture, sitting and ergonomics. Each exercise is completely illustrated. The Art of Changing, A New Approach to the Alexander Technique, Glen Park, Ashgrove Press, Bath, England. Freedom, balance and the Alexander Technique. Embodied Learning: Hips and Lower Back, Elizabeth Berringer, 30-minute lessons focusing on hips and lower back. Introduction to the Feldenkrais Method® Elizabeth Berringer and David Zemach-Bersin. Good introductory Feldenkrais Awareness Through Movement lessons. David was my Feldenkrais Trainer. *Many of these are classics and some are out of print but worth the effort to acquire a copy for your library.